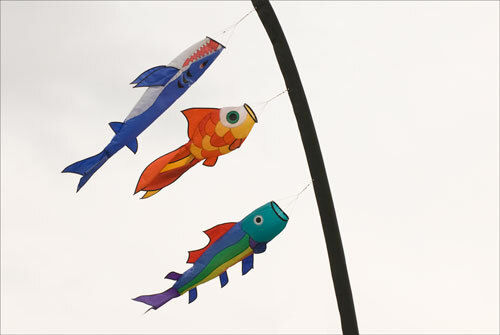 I saw these kites at a fair today, flying in the breeze hung on long vertical poles. From a distance they reminded me of the standards that armies flew that one can see in Japanese period films. Close up, I could see they are made of plastic, which took the edge of my interest for a moment – but the colours are vibrant and they look good. They now figure as one of the distinctive ecards at Quillcards – a site that features photographs set against colored backgrounds that fill the browser window.